The Brazilian rainbow boa is a round-bodied terrestrial boa of medium build. The head is not particularly large, but it is distinctly wider than the neck. Rainbow Boas are well known for their amazing iridescence caused by microscopic ridges on their scales that create a rainbow glow when they reflect light. There are three parallel black stripes on the top of the head and large black rings down the back that give the appearance of dorsal blotches. The round lateral blotches are black with an orange or reddish crescent across the top. Neonates and sub-adult Brazilian rainbow boas do very well housed in Rubbermaid containers or similar. Adults need a minimum of somewhere around 1.8 square meters (6 square feet) of caging. Though not an absolute necessity, perches and shelves can be added to the enclosure. Unless they are on several inches of loose substrate that they can burrow in, they should also be provided with adequate hiding spots. One at each side of the enclosure. Substrates that Brazilian rainbow boas do well on include thick layer of sphagnum/peat moss or cypress mulch. Neonates require a much higher humidity level than adults and can be housed successfully on paper towels for easier monitoring. It is recommended to keep your Epicrates cenchria in a natural light pattern that mimics normal daytime according to the season. 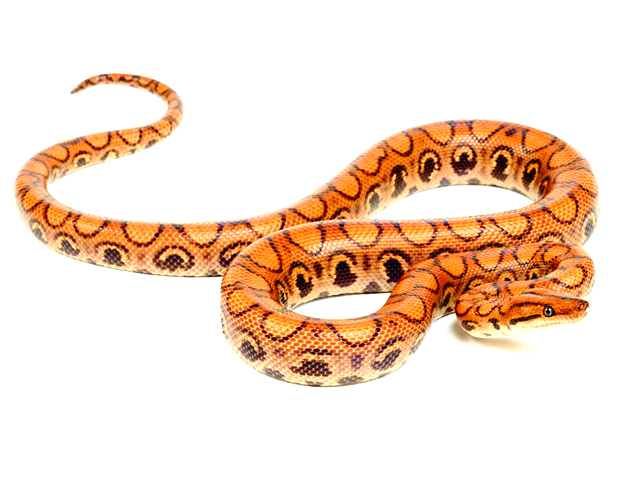 Brazilian rainbow boas are more tolerant of lower ambient temperatures than many other boids, though they cannot tolerate excessive heat well. They should have a temperature gradient of 24-28 °C (75 – 83 °F). Temperatures exceeding 29 °C (85 °F) can be fatal. Temps for babies should be right around 25 °C (77 °F). Rainbow boas should have free access to a large bowl of fresh water at all times (large enough to soak in). As adults they will usually drink large amounts of water and will not require nearly as high relative humidity in their cages. Adult Brazilian rainbow boas require a minimum humidity level of 75%+. For my adult rainbow boas I make a “damp hide” from a sweaterbox size tub with two access holes in one side. I put 1 inch of peat moss and one inch of green moss. Both nice and damp. They love to hang out in there and come out to explore at night. Neonate rainbow boas should be kept at or near 95%+ humidity. I accomplish this with a fairly tight fitting shoebox rack. There’s always condensation at the front. Humidity is affected by two factors, evaporation and dissipation. The larger surface area water dishes will evaporate more into the air. By minimizing ventilation, you will keep that humidity in the enclosure. Brazilian rainbow boas are voracious feeders that feed primarily on rodents, birds, lizards, and possibly aquatic life forms as well. In captivity they eat mice and rats approximately the same size as the largest part of the snake’s girth. Neonates are born large enough to take hopper mice and rat pinkies. If rainbow boas refuse food, their husbandry should be carefully examined. Stress, poor husbandry, or illness is the likely causes of a rainbow boa that refuses to eat. Brazilian rainbow boa babies should be fed on a schedule of from once every four days to once a week.These snakes are born large enough to take hopper mice as their first meal. Many of mine have done well starting out on rat pinkies. Brazilian rainbow boas will grow rapidly on one appropriately sized mice/rats a week. Feed at least once every 10 days, when the snake begins feeding on large meals such as rats feeding can occur less frequently. Brazilian rainbow boas can be somewhat nervous snakes. Babies are born striking at anything, but with regular, gentle handling they can tame down quite nicely to become acceptable pets. As baby rainbow boas, let them strike at you, bite you and even chew on you. This will show them you will not be chased away by those actions and they will soon learn the big bad hand is nothing to be afraid of. Pick up the baby with a steady non-tentative action. The baby will typically be coiled or piled in one spot. Aim for the side away from the mouth and just do it! If you are bit, there will be minimal pain and quite likely several pinholes in your skin. Resist the urge to pull back, that will only make it worse. Brazilian rainbow boa’s have teeth that curve backwards to hold onto their prey. If you pull away, you will tear your skin and could easily damage some of their teeth. Rainbow boas are typically a more active snake when being held than your average boa, seemingly always on the move. Be careful when holding not to startle them, as rainbow boas can nip when scared. Cages/enclosures should be checked weekly for soiling. If using a reptile bedding product you can spot clean the soiled location and replace the entire bedding when it looks or smells dirty. Frequency of a full clean will be determined by size of enclosure vs size of snake. It takes a lot longer for a baby to soil the bedding in a large cage than it takes an adult to soil the same size cage. If using a paper liner, simply fold it up and discard. When doing a full clean, you can disinfect the enclosure floor with a product like Nolvasan. Caution should be used with any cleanser as many are toxic to reptiles. For that reason I primarily use water and Nolvasan. I do occasionally use Dawn dish washing soap to wash items and rinse thoroughly. A diluted bleach solution ( < 10%)may be used but needs to be COMPLETELY rinsed off. Shedding is dependent on the animal’s growth rate and condition and may occur every 3 – 6 weeks. They may refuse feeding attempts while shedding. Increase the humidity as a rainbow boa approaches a shed, this helps to avoid dry shed. With proper humidity, the shed should come off without shredding. Can easily get torn but should not be tattered. If the rainbow boa is having a bad shed where parts are stuck on, wet a pillowcase, put the rainbow boa in the pillowcase and tie knot in pillowcase to prevent snake from getting out. Place pillowcase back in enclosure at a neutral temp location and leave for a couple of hours. If still not fully shed, you can continue pillow case treatment overnight. Using a fish tank with a screen top will lose most of the humidity and dehydrate your Brazilian rainbow boa. Should humidity drop into the 60’s or 50’s for an extended period of time the results can be respiratory infections, regurgitation, and death by dehydration.